St Clare HospiceBlogWhy bother with charity shop fashion? Why bother with charity shop fashion? St Clare Hospice’s Communications Officer, Emma Sugarman, shares her top eight reasons to shop in a charity store, and why your local shop should be your first stop on any shopping trip! Charity shops: they’re more than just a store. They’re a culture. To the seasoned thrift-shopper, a ‘charity shop crawl’ is the ultimate day out with a purse full of pocket money. The smart, sustainable shopper is aware of a charity shop’s potential fruits, just waiting to be harvested at the opportune moment! There are countless reasons as to why a trip to the local charity store should be your first stop on any shopping trip. The prices are low, and the win when you find something you love is big – not to mention that you are supporting a worthwhile cause or charity in the process. Read on to find out my top eight reasons why you should definitely bother with charity shop fashion. I promise: you won’t look back! Many people donate their pre-loved clothing to charity shops – sometimes with the tags still on! They are a treasure trove for the most beautifully bizarre, weird and wonderful fashions finds, as well those barely worn, fresh and fancy tailored pieces. When you approach the rails of clothing with a creative eye and a little bit of patience, you’re more than likely to find that ‘eureka-moment’ jumper of a lifetime – your diamond in the rough! When it comes to the cool and kooky, take an open mind with you. For example, picture that garish, oversized cardigan that looks like it’s been plucked from a crazy-cat-lady’s wardrobe. Yuck, right? But then, picture it in the window of Topshop, Urban Outfitters, Rokit… Suddenly, it’s pretty cool, right? Charity shops boast a plethora or varied items, of all different styles, trends and eras. Because there is probably no set ‘style’ that the shop is going for, you never know what you’re going to find – and you’re forced to choose the things that really stand out to you and your tastes! Plus, you know that no one else will have it, either. In my opinion, charity shops champion looking, feeling and being your best self. They are an emporium of wearables and homeware that celebrate your individual style. Sustainable fashion should be fun for everyone! Within the same universe as the comeback of vinyl is a strong retro-vibe within the world of fashion and retail at the moment. From interior design to high-street and high fashion wearables, the ongoing trend at the moment is a refresh of typical 70s – 90s fashion. 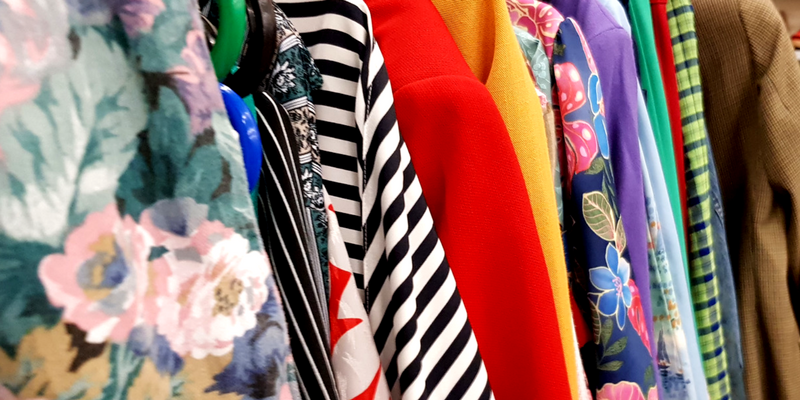 Where better to refresh your wardrobe than a charity shop, which stocks genuine 70s – 90s fashion? How authentic! In addition, each item is basically unique, and there are a lot of high quality goods on offer for affordable prices. I’m pleased to say that being eco-friendly is cool, again! You can’t get much more ‘green’ in the world of retail and shopping, than buying recycled, pre-loved clothes from a shop that donates all of its profits to charity – whilst also saving you money and not contributing to the mass production of brand-new clothing and accessories. It is undeniable that there is a growing awareness amongst the population that there is a need to ‘save our planet’, and charity store shopping is a sure-fire way to be green and save a few pennies. You get extra points if you donate your pre-loved goods to charity shops, as well! Look at all that cash you just saved! 3 tops, 2 bottoms, a handbag and a necklace – £20. Not bad, eh? With charity shopping, you can get what you need without breaking the bank. It’s also an opportunity to try new items and styles without there being a huge cash commitment. Even if you can afford to buy from a London vintage shop, or high-fashion designer labels if that takes your fancy – no one is above charity store shopping. If you can save money, then why not? Charity shops encourage you to get out and about on your local high-street. They’re not likely to be found in the huge, commercial, glass pane shopping centres. This presents you with an opportunity to get to know your local area a bit better – and who knows what else you might find? A cute café, a local butchers, or a delicious bakery? Go and find out, and support your local businesses! It recently occurred to me that every time I enter a charity shop, I’m faced with some little discovery that harks back to a childhood memory. Charity shops can be like museums of times gone by. Childhood toys, the sugar pot your Nan used to use, shoes like your mum used to wear – all of those little things we tend to forget. They’re still there – in charity shops! Shopping in a charity shop pays for the work of great non-profit causes and charities. When you shop with St Clare, your money is literally translated into vital care and support for people and families living in West Essex and the Borders of East Herts. It’s that simple! It feels good to shop knowing that your money is going towards something bigger than mere clothing; instead, it goes towards real, life-changing services out in the community. And there you have it. Not converted yet? You may still be a victim to one of these common myths about charity store shopping – the main reasons why people turn their noses up! If I had a pound for every time I heard, “someone else’s sweat and skin is in that top,” or “what if someone died in it” or “it smells like old people”, then I’d have enough to go on a really good charity shop haul. So what if someone else owned it before you did? You’re going to go home and wash it! I personally love the idea of maintaining the legacy of an awesome piece of clothing! You may or may not be ‘well-off’ if you shop in a charity shop. As I said earlier – no one is above charity store shopping. Either way, you’re saving money and getting to wear unique clothes that no one else has. What’s so bad about that? Charity store shopping is supposed to give you bragging rights! “Oh, you like my Italian, tailored, hound’s-tooth check blazer with red velvet piping? £2, charity shop.” *absolutely buzzing inside*. You’re an icon if you’re wearing clothes from a charity shop; no one can imitate your unique style! Charity store shopping can often require patience. It’s not the same as going into your favourite store where you pretty much like everything on the rails. Charity store shopping is about finding that one incredible item that you will love forever and paying £2 for it. Spending extra time in a shop looking around for that golden item is supposed to be worth the pay off. Emma Sugarman is the Communications Officer at St Clare Hospice. With a passion for individual dressing, Emma is keen to encourage more people to shop in charity stores, supporting local causes and enjoying sustainable fashion. Volunteering with St Clare Hospice’s new vintage shop, Scarlet Vintage & Retro, Emma aims to join a wider campaign in empowering people to look, feel and be their best selves.